Just finished up 8 great days with Toni from Central California. Toni put together a couple of great looking pieces. His mallard fox combination came out AWESOME!!! We ran short on getting all the habitat finished, but even unfinished it looks great and his pheasant came out fantastic as well. Toni, way to hang in there with all your travel issues you did a GREAT JOB!!! Thanks for choosing ASOT! I had great time instructing Kevin on the basics of life-size mammals. Kevin ventured down from Alaska to do 10 days of training. As you can see, his mounts came out far from basic! His 1/2 life-size grizzly bear was a stunner!!! Kevin, thanks again, and thanks for choosing ASOT! "In July I spent 9 days with Troy learning life size mammals. I had very limited taxidermy experience and Troy's astounding taxidermy abilities and teaching techniques made learning taxidermy fun and exciting! I was able to put together 2 wolverines, 1/2 mount grizz, and a ptarmigan. For those of you looking to learn taxidermy or advance your skills than the Artistic School of Taxidermy is the right place for you. I can assure you his pricing is extremely reasonable and more than comparable to any other taxidermy school in the country. The accommodations are even better, the living space, shop, food and drink are available to you at all times of the day/night. You definitely won't go home hungry but you may go home sleep deprived from the long hours in the shop and through it ALL Troy is right there to teach and guide you. If you are looking to attend the best school in the country with the best taxidermist than look no further than the Artistic School of Taxidermy. You will NOT leave disappointed but you will be craving to return for more! Thanks again Troy for everything!!!" 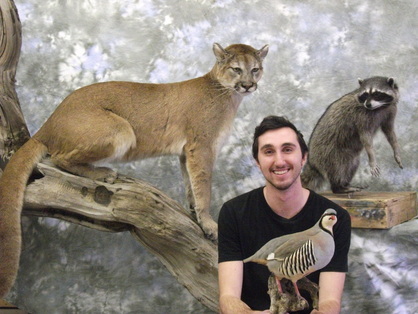 Mike traveled from Wisconsin to continue his endeavor in taxidermy. Mike did a strutting turkey, a couple of birds and a really cool otter piece. You don't need much of an imagination to see the "Two Otters Swimming", and that my friends is why we call it ART!!! Mike, you were a great individual to teach. Can't wait to see your bases finished! "This might be the most challenging review I have had the pleasure to write. It is hard to decide where to even start. The hospitality, lodging, and instruction are all 5 stars and included in the price! Anyway here's my best shot at doing justice to a decision I should have made years ago. I recently spent 10 days working under the guidance of Troy. I am a professional educator and watching Troy teach his talents to another student and myself was truly remarkable. He was able to tailor his instruction based on each individual's background knowledge and effectively balance instruction between two students. I also worked on several pieces in a 1 on 1 setting and I can say that having the 2nd student didn't compromise my experience. He will see to it that you produce a quality piece and understand how to repeat it when you leave.The tricks and techniques that he has taught me will save me time, money, and drastically improve the overall quality of my finished pieces. Troy's passion and gift to gel taxidermy into award winning works of art is an intangible that in my opinion cannot be ignored when considering choosing an instructor. The scenery and lodging were better than I could have imagined. Each morning and evening, we watched deer, elk, turkeys, and a slew of other wildlife work the yard and mountain side as we enjoyed our coffee, meals, and drinks. I can't count the number of times somebody commented about the beauty we were surrounded in. When you put in 12 hour days having a view like this makes it easy to unwind. I had zero issues falling asleep after the long days, but the bed was comfortable and clean,which is more than I could say for the hotel I stayed in when I stayed in Boise! It has only been a few days but I know that I will be making plans to return soon. 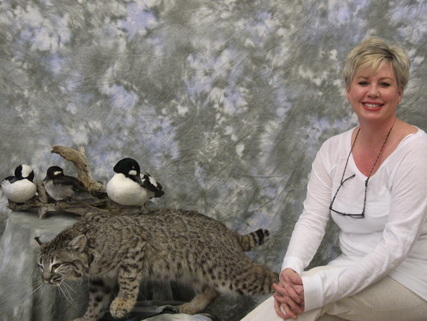 Whether you are interested in learning taxidermy for the first time or furthering your taxidermy understanding Artistic School of Taxidermy should be at the top of your list. Just don't take my dates!!!!!!" Had the pleasure to teach yet another great student from North of the Border. Jake from Canada just finished up ﻿12 days﻿ of training. Jake did one heck of a job on his Mtn. Lion. I'm not sure how we pulled it of, but his cat almost fit perfect on the log we found for it. We were not able to complete the finish work on Jake's pieces, but he also did a great job on a lifesize raccoon and a chukar. Way to go Jake! Hope to see you in the future!!! Had the pleasure of instructing Pam from Tennessee for 10 days. Pam came to learn how to do ducks and medium life-size. We were not able to get her birds or bobcat painted, or her bobcat put on a natural wood base but none the less, she did a fantastic job on her pieces. Way to go Pam!!! Hope to see you back again. Here are a couple of pieces Natalie knocked out while she was here. Nat did a beautiful job on a landing pintail and a stellar job on a pine martin. Nat had to do some major form alterations on her pine martin as she wanted it doing something other than standing. Nat you were a blast to teach. Looking forward to your return! 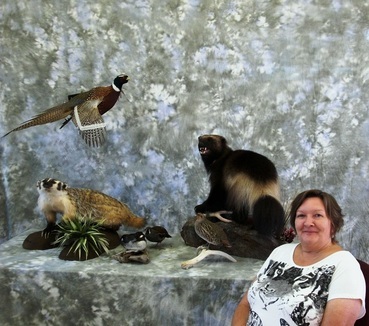 Safe travels, and thanks again for choosing Artistic School of Taxidermy! Once again, I had the pleasure of instructing a return student from Southern Oregon. This was Bill's forth time back. He came to learn large life-size mammals and turkeys. Even without putty and paint, his bear looks awesome! The turkey was a little rough, but that was the condition of the bird, and you can only do so much. Nonetheless, Bill you did a great job on both of your pieces, and it was great having you back!!! Thanks for choosing Artisitc School of Taxidermy! Hey everyone, here is JoAnne with some fantastic pieces she did over a 16 day period. The pheasant wasn't quite dry enough to paint, but everything else was completed and came out GREAT! JoAnne, you were a dedicated student and a pleasure to teach! Safe travels home! "If you are on the fence as to which school to choose, I can assure you that Troy's school will instill the confidence and technique you are searching for. I attended his school and have learned at other quality facilities. The package deal of food and lodging combined with the longer work days you are able to put in do not compare to the others. If you are seeking to learn the art of taxidermy why not learn from an artist that has a history of producing award winning pieces?"